In recognition of his many contributions to the power sweeping industry, Allan Heydorn is recipient of WorldSweeper.com's Award of Excellence in Power Sweeping for 2010. 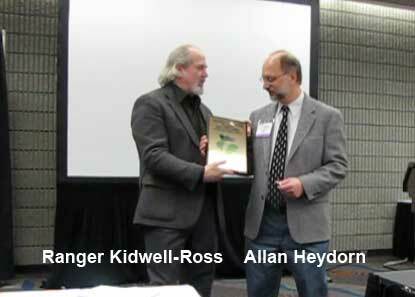 Our editor, Ranger Kidwell-Ross, presented the award to Allan Heydorn at the 2010 National Pavement Exposition in Nashville, Tennessee on January 22, 2010. You may view a video of the presentation by clicking on the YouTube.com video link shown below. Allan Heydorn became editor of PAVEMENT Magazine in 1990, at the time the publication was sold to Cygnus by its initial publisher, The Aberdeen Group. Although Heydorn had a journalism degree, he knew nothing about the pavement or power sweeping industries. Over the past 20 years, from his position of editor at PAVEMENT and as coordinator of conferences at the National Pavement Expositions (NPE), Allan Heydorn has become one of the unquestioned information leaders in the U.S. pavement industry. "I have a story that shows how little I knew about the pavement industry," reminisces Heydorn. "The week before I took my job with Cygnus I sealcoated my own driveway. This involved something like 13 five-gallon cans of sealcoat. It took all day and it was just a back-breaking project. I later learned, of course, that I could have hired a seal-coating contractor and had a much better job done for less money." As editor of the multi-faceted PAVEMENT publication, Heydorn has to perform a monthly juggling act to provide balanced coverage of all facets of the pavement industry, including power sweeping. His successful approach has been one of seeking to involve active participation by manufacturers, associations and major contractors in each segment. For sweeping contractors, there could be little argument that the National Pavement Exposition is the premier place in the U.S. for gaining education about running a more successful business. It also offers a unique opportunity to attend seminars and view equipment from allied types of business, which tend to be the initial best ones for sweeping contractors to branch out to perform. For example, in the sweeping industry Heydorn has involved the North American Power Sweeping Association, which helps in the development of NPE seminar topics for sweeping contractors. "I recognize the value industry associations offer, and do whatever I can to involve them in all of the pavement-related segments we cover," says Heydorn. To encourage NAPSA membership, as Conference Coordinator Heydorn has, in the past several years, started offering several NPE seminars free, or at a discounted rate, to attending NAPSA members. This allows those attendees to be able to afford more of the other seminars which, in turn, is an encouragement for adding other, pavement-related types of business to their current company job offerings. "I hope that our involvement with providing discounted seminars to NAPSA members will encourage more of them to attend our shows. I believe that encouraging a high level of involvement from all of the industries in the pavement maintenance and reconstruction fields is a way to establish a 'win/win, rising tide floats all boats' type of scenario." The above comment exemplifies the reason that Allan Heydorn was chosen as recipient of this year's WorldSweeper.com Award of Excellence in Power Sweeping. Heydorn has worked diligently for two decades to promote not only power sweeping, but the concept of pavement maintenance in general. The many NPE conferences that Allan Heydorn has selected and organized have served as the springboard that has allowed many sweeping contractors to become more professional and successful in their core business of power sweeping. They have also provided the information needed for expansion into other services that involve pavement maintenance and reconstruction. We offer an approximately 13-minute audio interview with Allan Heydorn, recorded on January 14, 2010, just prior to the 2010 National Pavement Exposition in Nashville, Tennessee. You will see that link shown below this paragraph. In the interview, Heydorn discusses his career in covering the pavement industry, as well as provides his insight into what makes a successful contractor in today's marketplace. Allan Heydorn may be reached via email, or by calling him at 708-354-7039. The website for the National Pavement Exposition is www.nationalpavementexpo.com. The website for PAVEMENT Maintenance and Reconstruction Magazine is www.forconstructionpros.com.